I recently had the pleasure of presenting a program and book signing at Itasca Park’s Brower Visitor Center. Shown in the photo is Itasca’s Lead Interpretive Naturalist Connie Cox introducing me. 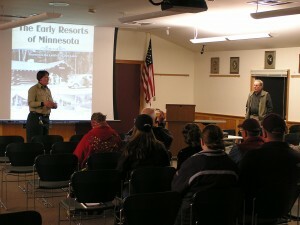 The program with slides covered early tourism and resorts in and around Itasca State Park. Emphasis was on the Source of the Mississippi and probably the most famous resort hotel in Minnesota, Douglas Lodge, as well as Depression era CCC buildings such as Forest Inn. Other early places to stay in or near the Park included McMullen’s Ranch, Wegmann’s Cabin, Parkview Resort, Headwater’s Inn, and Sauer’s Resort and Post Office. Members of the audience added information on some of the early routes to Itasca, including the Turnbull Road and the Jefferson Highway. I would like to thank Connie Cox for her assistance and my son Randy, for his help in setting up the program.